Artichoke belongs within the thistle family (Asteraceae), in the genus; Cynara. The globe artichoke has arched, irregularly lobed leaves which are silvery green in color, reaching 50–82 cm in length and possessing a few spines. The flowerhead is 4–8 cm in diameter with numerous triangular scales and individual florets which are purple in color. Artichokes mature in 150 to 180 days after sowing and can reach heights of 1.4–2 m. Beautiful light pink flowers develop in a large head from the edible buds. The bud is composed of compactly arranged triangular scales in a whorl fashion around a central "choke." Each artichoke globe measures about 6-10 cm in diameter and weighs about 150 g. Fuzzy; immature florets at the centre of the bud constitute its "choke." These are inedible in older, and larger flowers. Edible portion of the buds consists primarily of the fleshy lower portions of the involucre bracts (triangular scales) and the base, known as the "heart." Artichoke is one of the popular winter season, edible flower bud of the Mediterranean origin. Artichokes can be found throughout Europe, the Middle East, and the Americas, but they are less frequently encountered in Asian nations. Using artichoke as a vegetable is well known since ancient times for its medicinal and health benefiting qualities. Artichokes are primarily consumed due their associated benefits of protecting against various forms of cancer, bolstering immune system strength, lowering cholesterol, and protect against diseases such as diabetes, artherosclerosis, heart attack, and stroke. Artichokes have also long been famous for detoxifying the body and improving the health of the liver, and aiding in digestive issues like indigestion, constipation, Irritable Bowel Syndrome, and diarrhea. Furthermore, this miraculous little thistle can reduce blood pressure, eliminate hangovers, and stimulate urination. Artichokes are low in saturated fat and cholesterol, while being a rich source of fiber, vitamins and minerals. It contains vitamins which include vitamin C, thiamin, riboflavin, niacin, folate, vitamin B-6,B-12, A, E, D and vitamin K. Artichokes also provide minerals such as calcium, iron, zinc, sodium, potassium, manganese, phosphorus and zinc. The following is the nutritional breakdown for a medium-sized artichoke that weighs about 125 grams. Fiber adds bulk to the food you eat, which helps to keep your bowel movements regular and normal, and decreasing the symptoms of constipation, fiber can reduce chances of a variety of stomach and intestinal cancers, as well as bloating, cramps, excess flatulence, and general discomfort in the stomach. Furthermore, if you have problems with loose stool or diarrhea, fiber can absorb excess liquid and form healthy, predictable bowel movements in patients. Fiber also acts as a clean up crew for excess LDL cholesterol, thereby cleaning your arteries and further reducing your chances of heart disease. Dietary fiber is regarded as a vital aid in weight control. This is because eating artichoke helps one feel full, hence reduces food intake, weight control. Fresh artichoke is an excellent source of vitamin, folic acid. Folic acid acts as a co-factor for enzymes involved in the synthesis of DNA. Scientific studies have proven that adequate levels of folates in the diet during pre-conception period, and during early pregnancy, help prevent neural tube defects in the newborn baby. Fresh globes also contain moderate amounts of anti-oxidant vitamin; vitamin-C. Regular consumption of foods rich in vitamin C helps the body develop resistance against infectious agents and scavenge harmful, pro-inflammatory free radicals from the body. The antioxidant properties of artichokes come from a number of sources, one of which are polyphenols, which are found in high numbers in artichokes. Polyphenols have chemopreventive qualities, which means they can slow down, stop, or completely reverse the effects of cancer in patient. Their antioxidant ability comes from another source as well, their high levels of quercetin and rutin, two specific antioxidants that have been proven to reduce the chances of developing cancer. The extract from artichoke leaves can be used to induce cell apoptosis (cell death) as well as cell proliferation when injected in cancerous masses, and can reduce the chances for and effects of prostate cancer, breast cancer, and leukemia. Finally, the flavonoids found in artichokes have been found to reduce chances of breast cancer as well. Basically, eat your artichokes if you want to avoid getting cancer! Artichoke is one of the very good vegetable sources for vitamin K. Vitamin K has potential role bone health by promoting osteotrophic (bone formation) activity. Adequate vitamin-K levels in the diet help limiting neuronal damage in the brain; thus, has established role in the treatment of patients suffering from Alzheimer's disease. Artichokes are one of the best foods on the market for acquiring vitamins and minerals, particularly minerals like magnesium, phosphorous, and manganese. These minerals are essential parts of increasing bone health and density, thereby reducing the chances of conditions like osteoporosis. Artichoke is an also good source of antioxidants such as silymarin, caffeic acid, and ferulic acid, which help the body protect from harmful free-radical agents. Artichoke is also rich in B-complex group of vitamins such as niacin, vitamin B-6 (pyridoxine), thiamin, and pantothenic acid that are essential for optimum cellular metabolic functions. Further, artichoke is rich source of minerals like copper, calcium, potassium, iron, manganese and phosphorus. Potassium is an important component of cell and body fluids that helps controlling heart rate and blood pressure by countering effects of sodium. Manganese is used by the body as a co-factor for the antioxidant enzyme, superoxide dismutase. Copper is required in the production of red blood cells. Iron is required for red blood cell formation. Artichokes therefore act as a vasodilator and is particularly useful for those already taking hypertension medicine to prevent the effects of potassium deficiency. Diabetics are also encouraged to eat artichokes to prevent the complications associated with blood pressure and that disease. 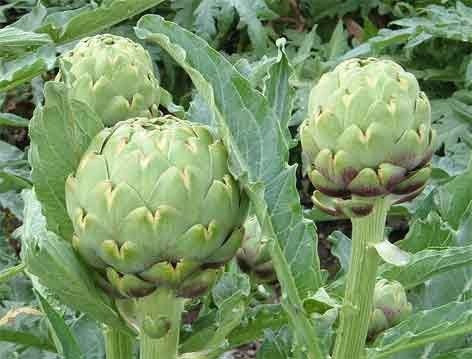 There are a number of aspects of artichokes that make them beneficial for brain health, including their quality as a vasodilator that allows more oxygen to reach the brain for elevated cognitive function, for phosphorous an essential mineral that is found in artichokes and is also packed into brain cells. Artichoke has been traditionally used to alleviate mild indigestion. The cynarin contained in an Artichoke increases bile production, which in turn helps the body digest fats more efficiently and receive greater benefit from the fat-soluble vitamins. Bile works by emulsifying the fats consumed, rendering them more easily absorbed and processed by the small intestine. Most gallstones are created when high concentrations of cholesterol in the gallbladder crystallize. Gallbladder or biliary disease is diagnosed when gallstones cause pain by stretching or blocking the bile duct. People who have had gallstone symptoms in the past should be aware that increasing bile production can push existing stones into the bile duct. Studies indicate that Artichoke Leaf extract can reduce the symptoms of irritable bowel syndrome (IBS) and functional dyspepsia, activity that may be related to improved fat digestion. Although these benefits seem tremendous, there are dangers connected to almost any food item, and it is important to do your research. 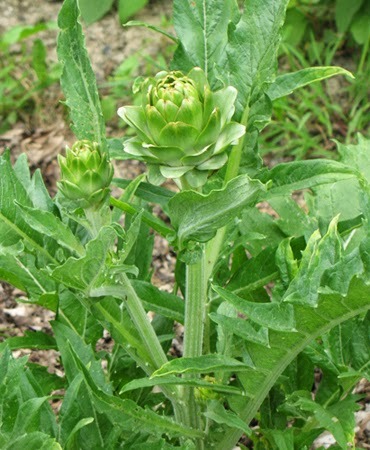 Some people are sensitive to the effects of artichokes due to allergies, particularly in terms of artichoke leaf extract, since it is in such a concentrated form. Since artichokes are technically a thistle, not a vegetable, they are closely related to ragweed, daisies, marigolds, or chrysanthemums. Many people who suffer from those allergies might also have a bad experience with artichokes. Those patients with liver disease or gallbladder conditions already should not begin adding artichokes to their diet because they can exacerbate certain negative aspects of the disease. Artichokes should be used as a preventative method for liver and gallbladder disease, not a cure. Finally, it does make people urinate more frequently, so if you already suffer from an overactive bladder, artichokes could make that minor condition even worse.